Dark humor accents this exposé on cultural clashes between Chicago’s suburbs and working class in the 1990s. 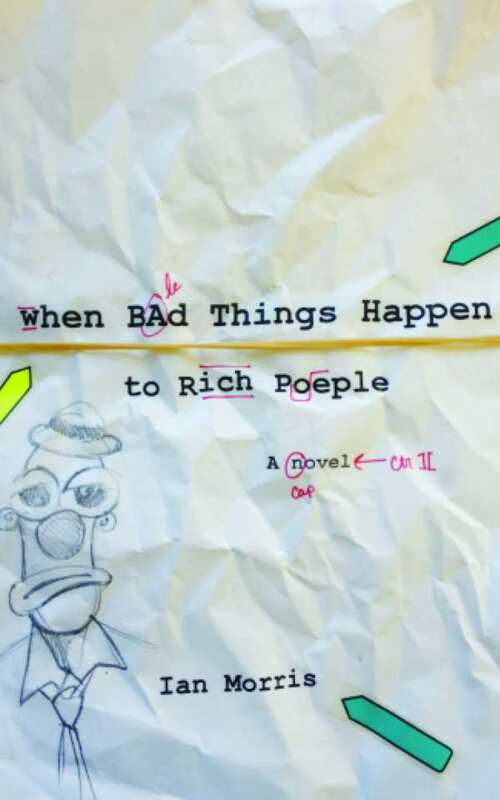 With his first novel, When Bad Things Happen to Rich People, Ian Morris has created a sharp and clever story about the class divide in modern America, told through the experiences of a once-promising writer now down on his luck. The writing is enjoyable, the humor effective, and the characters memorable, making this a noteworthy debut. The protagonist, Nix, is an adjunct professor at a Chicago college, whose life hasn’t quite gone to plan. The novel opens with him literally calculating his worth, listing his monthly income and expenses. His wife is planning to get pregnant, partly as a way of keeping her writing job by better relating to the target demographic. Nix’s department is cutting his workload, with the boss openly giving preferred spots to the woman he’s seeing socially. The one thing Nix has going for him is a new side gig—he has been recruited by an eccentric businesswoman to ghostwrite her autobiography. Morris gets some sly laughs from the cultural clash between his well-educated but financially needy protagonist and the social circles his new gig makes him navigate. The author accurately describes Chicago in the 1990s and the way wealthy suburbs and working-class city neighborhoods can sometimes seem like separate nations. He gets great mileage out of the main character’s string of bad luck and bad decisions, while keeping him relatable enough. Nix was essentially born into the counterculture as the son of an underground comics artist and had his own fifteen minutes as a writer whose book was nearly universally hated, generating more controversy than fans. Morris does an outstanding job of using this backstory by including genuinely funny details on the failure of Nix’s career or by having people from his past popping up as needed to flesh out his character. Zira Fontaine, the woman whose life Nix is hired to write, has her own well-developed and often-odd past and runs both a household and a currency-trading company that come with more intriguing personalities. What should be a dream gig for a struggling writer begins to take over Nix’s life, causing him to instead struggle with every other aspect of his life and legacy as he tries to complete Fontaine’s book. Morris tells his story well, with a strong mix of introspective moments and dark humor, letting his protagonist see how the other half lives—without making his own life look any better by comparison.